The Canadian Fed Cup team faces off against the Netherlands this weekend hoping to move out of World Group II into World Group I for next year’s competition. That would involve defeating the Dutch at the Maaspoort arena in ‘s-Hertogenbosch – knowing locally and more simply as Den Bosch – Saturday and Sunday and then beating one of the losing team’s from this weekend’s action in World Group I in a tie to be held in mid-April. The Canadian women – Francoise Abanda, Bianca Andreescu, Gabriela Dabrowski and Rebecca Marino – arrived in Den Bosch on Sunday and were able to practice on the red clay court on Monday even though it didn’t officially have to be ready until Tuesday. All four players have Fed Cup experience but this has to be extra special for the 28-year-old Marino who has not played since Canada lost 3-2 in Koper, Slovenia, in April, 2011. In that tie, she was 1-1 in singles with the other Canadian singles player being a 17-year-old Genie Bouchard. That means it has been almost eight years since Marino’s last Fed Cup appearance. It would appear that, with the No. 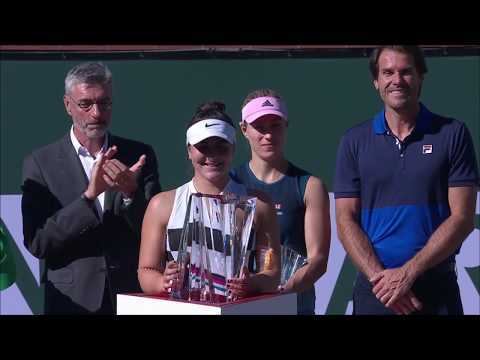 70-ranked Andreescu as the presumptive Canadian No. 1, No. 209 Marino would vie with No. 223 Abanda for the No. 2 singles spot. As for the Dutch, it looks like it will be No. 129 Arantxa Rus, 28, and No. 150 Richel Hogenkamp, 26, as the singles players. Hogenkamp defeated Andreescu 6-3, 7-6(9) in the final round of French Open qualifying last May before Andreescu got revenge on the Dutchwoman, 4-6, 6-3, 6-1 in the qualifying for the National Bank Challenger in Saguenay, Que., last October. The obvious absentees in Den Bosch are No. 80-ranked Genie Bouchard for Canada and No. 8-ranked Kiki Bertens for the Netherlands. The 28-year-old Dutchwoman is skipping Fed Cup to concentrate on her singles career. That decision would appear to have been vindicated on Sunday when she won her eighth career title at the WTA Premier event in St. Petersburg, Russia. This will be Heidi El Tabakh’s first tie as Canadian Fed Cup captain and she has Frenchwoman (on left) Nathalie Tauziat, the ex-world No. 3 (2000) and 1998 Wimbledon finalist, along as coach. The hitting partner for the tie is a former top-ranking Canadian junior Hugo Di Feo. The 23-year-old from Montreal recently graduated from Ohio State University with a marketing and communications degree. Speculation might be that the Dutch Tennis Federation originally decided to put down the red clay court thinking that Bouchard would play. Not that Bouchard is a poor player on clay – but the actual reason is that it is trying to promote clay-court tennis because red clay is the traditional surface in the Netherlands. Equally, it wants to get the message out that clay is the superior surface for young kids to learn the sport on. Early reports are that the red-clay court is playing well – hopefully that keeps up because a similar indoor clay court in Bratislava, Slovakia, was kind to Canada’s Davis Cup team last Saturday. Above, Dutch captain Paul Haarhuis talks to doubles specialist Demi Schuurs on the right on Tuesday. The most useless stat about this seventh Fed Cup meeting between Canada and the Netherlands is the 3-3 head-to-head. First off, the most recent meeting was in 1987. Canada won three from 1980 to 1987 and the Dutch were victorious three times between 1970 and 1974. But most important of all – there was no home-and-away format in those days. The Fed Cup was just played at one location, as was the case with the 32 teams at the Hollyburn Country Club in Vancouver in 1987. Before Vancouver it was held in places such as Prague, Berlin, Naples, Perth and Freiburg. Really – the most relevant stat is that neither Canada nor the Netherlands has ever won the Fed Cup. It’s still more than nine months away but the 2019 Davis Cup Final in Madrid has begun to take shape. On Monday, the International Tennis Federation announced three six-team groupings for the round-robin phase. The three groupings were determined by each nation’s Davis Cup ranking – with Canada at No. 13 being in the third group. One country from each group will be drawn on February 14 – Happy Valentines Day somebody! – to form six three-team round-robin groups with each team in the group playing each other (two ties) in the preliminary phase. It will be two singles and then a doubles played on one day. The six group winners and the next two best teams will advance to the quarter-final stage. The two lowest teams of the 18 will suffer the unkind fate of dropping to zonal competition in 2020. Below are the three groups of six with the best teams in bold – just a subjective judgment based on the top players in each country. This is all speculative, and we know world No. 3 Sascha Zverev has said he won’t play and No. 1 Novak Djokovic, the ATP Player Council president, may be more inclined instead to play the ATP’s World Team Cup to be held in January, 2020, in Australia. So if Zverev and/or Djokovic doesn’t play – you can un-bold Germany and/or Serbia. As well, the ATP Finals championship match is at 3:30 p.m. on Sunday, November 17 and the players involved, or even those involved in the semi-finals of that important event, would have to start just two (or three) days later in the round-robin phase of the Davis Cup Final. Looking at the above groupings – ideal for Canada to play against from the first one would be Great Britain which almost certainly will not have Andy Murray but should have Kyle Edmund who’s not playing well at the moment – and then maybe Kazakhstan from the second grouping of six. The bottom line is there’s certainly a financial incentive – the winning nation will receive about $2.4 million (US). Already each of the 18 qualified countries is guaranteed $600,000 to be shared among the players and $300,000 to go to the national (tennis) federation. Bicycles and canals, they arse everywhere in Amsterdam – surely one of the most livable cities in the world.